What if we told you there’s a free way to prove the value of the links you share on social? Well, there is. We’ve written about UTM codes before, and yet many marketers are afraid of them. We understand why. Sprinkle in an unknown acronym and mix it with the terms “code” or “strings” and those of us who aren’t crazy for analytics immediately tune out. Being a social media manager means you have to be willing to take on the challenges of the technical space. UTM tracking is one of those strategic areas that cannot be ignored any longer. It’s deceptively simple, and once you get set up, analysis is basically hands free. Using UTM tracking is a cornerstone of content analysis and it’s one of the few ways to legitimately prove the ever elusive ROI of social media. In this article, we’ll talk about the basic outline of a UTM code, and the value UTM tracking can bring to your social media and content strategies. Link tracking isn’t new, and those who are already using it are ahead of the curve. If you’re already using UTM codes, we’ll walk you through a few creative ways to incorporate link tracking that will support a cross functional social media strategy. UTM stands for “Urchin Tracking Module.” The only important thing you need to extract from that is the word “tracking.” UTM’s are simply a tracking device. Rather than digging around your Google Analytics report looking for where people were acquired, and then trying to decipher if they came in from a Tweet or the link in your Twitter bio—UTM codes can tell you the whole story, upfront. If the word “codes” freaks you out, think of them as labels or tags that you add to a URL. There are a few basic categories for these tags. These categories are often referred to as “parameters” because that’s exactly what they are. UTM parameters are tags you add to the end of a URL to tell Google Analytics (or your CRM) a full story about where and why a person clicked. There are endless possibilities for how many parameters you can add to a URL, but for the standard UTM recipe there are three that are required. If you want to get even more granular, you can add further detail to the link with some extra parameters. Appending additional UTM parameters can help you drill down to as many variables as your heart (Or CMO) desires. Okay, so it’s not quite as simple as adding plus signs between words directly after a URL. That’s where the word “code” comes in (and easily scares us all.) We will walk you through building your own. 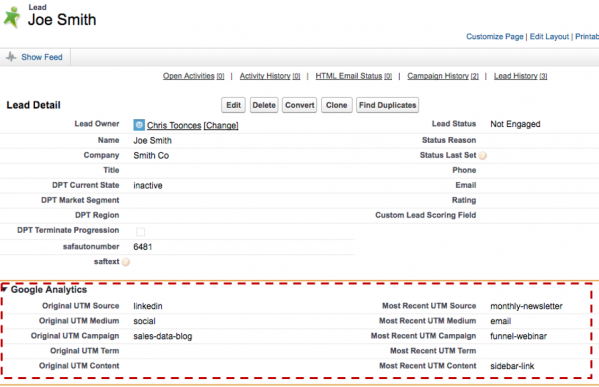 So if UTM tracking is this easy, why doesn’t everyone do it? It would take a lot of time and effort to manually build UTM codes each time you send out a new link with a different parameter. With so much on the plate of a social media manager, it can be frustrating to have to remember to build a code every time you sent a link. Also, they are long and ugly. But don’t worry. There are ways to work around these challenges and streamline UTM building so it can scale as you grow. You may have noticed that it seemed like a lot of work to append all those parameters to the end of that chosen URL. Who wants to spend their time doing that for every link? Remember, it’s 2017 and this is the internet. If you have a problem, there is a solution. Enter UTM URL builders. These handy tools allow you to enter in your selected parameters and run—they build the entire url for you. No coding involved, just copy and paste. Two very popular URL builders are UTMFTW and GA Campaign Builder. UTMFTW in particular has a chrome extension that makes UTM building on the fly a real world possibility. In addition, there is a built in link shortener which solves the problem of those long links. While there are many use cases for using UTM codes, there will be times when you have a long standing campaign that you’ll need to use continually. For instance, your day to day organic social publishing strategy. In these cases, having a built in URL tracking system within your social media publishing tool can be helpful. That’s where Sprout comes in handy. 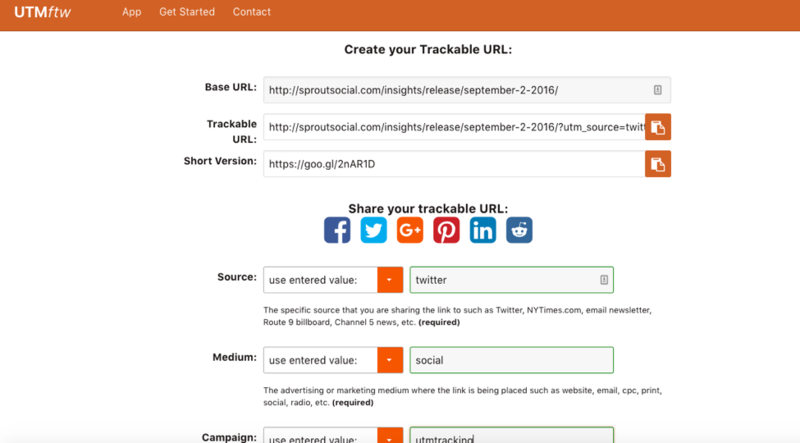 URL Tracking in Sprout Social makes it seamless to append tracking data to the links you post from Sprout. Sprout lets you define campaigns upfront. Any time you publish, Sprout automatically generates the relevant URL parameters, instead of requiring you to use a URL Builder to generate rich destination URLs each time. In the spirit of crushing two UTM challenges in one fell swoop, the tracking code is appended to your URL once it is shortened with bit.ly. You can try Sprout free for 30 days and see our URL tracking in action. One of the greatest benefits of UTM tracking is the insight it can provide on the performance of your content. UTM codes give you the power to test what content is resonating and where. Many marketers hypothesize or make assumptions, and often end up steering their marketing departments astray in the midst of trying to make sense of muddled data. UTM data will let you see if content is driving traffic, and also how valuable that traffic actually is. By tracking UTM codes, you can explicitly see if specific campaigns may have driven a lot of traffic, and if that traffic actually converts. These types of observations allow you to shift your content strategy with conversion in mind. Having a sense of where quality traffic is coming from can be an additional insight that helps to refine your overall publishing strategy. Before UTM codes, controlling content variables for A/B testing was nearly impossible. But now you call the shots. Source and Medium should always stay the same to make true A/B comparisons. Campaign, Content, and Term are some of the variables you can test against. Once you launch a campaign, try and stick with the same naming conventions to maintain consistency within tests, and to leave space for future tests. Not only do UTM codes help prove the awareness value of your content, but tracking a UTM code can also provide quantitative data in terms of conversion. By setting up goals in Google Analytics, you can instantly tell if the content you’re sharing is converting. Not only does this make it possible to prove return, it allows you to optimize your content strategy based on what is converting, and thereby increase your rate of return. This is where content analysis and smarter marketing come together to provide real numerical results. Client relationship management systems like Salesforce will even let you tie direct client accounts to the source and medium parameters that got them to your site. Return on investment for social is no longer a mystery, but findable with the right tooling, structure and diligence. Does your social team support multiple departments within your organization? Set different UTM campaigns based on your goals to be able to provide more rounded insights to respective teams. For example, the HR department of your company might not care how much traffic you are driving to your website as a whole, but would probably love to hear how many applicants you are driving to the career page. UTM’s can provide that data. If you’re doing social right, then you’re being proactive and not just reactive. Social provides the rare opportunity for brands to connect directly with their audiences. In those moments of genuine conversation where dropping a link to your product/service feels appropriate, don’t let it end there. Track those links, follow their lifecycle to conversion and continue to refine your outreach tactics to emulate your successes. We all know it’s great PR to get mentioned in an article by a top-tier publication, or to do a guest post on a high-ranking blog. These co-marketing opportunities usually allow you to provide a link, so why not a coded one? This can provide unique insight on what mentions are driving quality leads and where to focus your pitching efforts in the future. Advocacy is becoming a priority at organizations of all sizes. Whether it be for in-house employees or a curated group of loyalists, brands are becoming acutely aware of the value of social media communities. Taking on an advocacy marketing venture can be an overwhelming ask for a company, a community manager or for the community. Attaching UTM codes to the links your advocates share is a scalable way to immediately prove the value of an advocacy program to all involved. Influencer marketing is hot right now. The more influencers the merrier. Whether you have a paid influencer relationship or an organic one, the likes may be rolling in but the conversions could be stagnant. Curating custom UTM’s for marketing partners or influencers will allow you to track if and when they are sharing and how well they convert. On social media, there are many opportunities for people to click through to your website and it’s not just in your social posts. Your Twitter or Instagram bio are good examples of static links you can track with UTM codes. You might be surprised how much traffic these static links are driving to your site. From email to social marketing, messaging is becoming more dynamic. If you’re testing to see how different segments of your audience will respond to the same type of content, your best bet is UTM tracking. Organic targeting is a a good way to test audience segments on social. You can use the same terms in your targeting parameters when you go to build your UTM parameters. Last but certainly not least, adding unique parameters to your destination URLs can help you better measure conversions on paid social campaigns. You can also get a better idea of how paid social performs vs organic social. Talk about getting an instant ROI. At first, UTM tracking might seem intimidating. But after putting together a couple campaigns and streamlining your process with the tips we gave, you’ll become a UTM tracking ninja in no time.